This article will help you identify the best 3D printer for kids. The criteria I’ve used to identify these printers is the age of children. 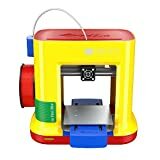 The printers I have reviewed offer a fun way of introducing your children to 3D printing and a possible career in engineering or a similar field. Exposing your children to a 3D printer from a young age gives them hands-on experience with manufacturing scale models and an advantage that they can’t get from simply reading about 3D technology. Your children will find it fascinating to design their models and watch them take shape right before their eyes. Below, I have only reviewed the best printers you can buy in 2018. Your children will get a rich experience when they interact with the 3D printers. Are Your Kids Ready for a 3D Printer? If you are an early adopter of technology, you would notice that 3D printing are no longer something for the future. It is already here. 3D printing is useful for everyday industrial use, from smartphones to cars, jewelry to medical, and much more. It is better for kids to learn about 3D printing technology right away. With these printers, your children would not only learn but also have hands-on physical experience in 3D printing. Price should not influence your decision to get a 3D printer. Instead, consider the advantage your children will have in terms of hands-on physical experience. With 3D printing, you would want a model in a couple of hours. The technology speeds us modeling and reduces the tedious design cycle of inventing, designing, producing, testing, and improving products. Children that want to explore a career in engineering could greatly benefit from having a 3D printer. A 3D printer for kids will give your child hands-on physical experience by manufacturing their own products. This is quite something that engineers are living for. It is an exciting experience to imagine a design and have it in your hands in hours. This might also be a good way of demonstrating to your kids that engineering is fun. And who wouldn’t their children to be engineers? In 2016, the starting salary of engineering graduates was around $62,500, which could rise to an average of $100,000. An Engineering career is also more fulfilling in contributing to society. Technology adoption in schools is relatively slow. This is usually because schools are underfunded and have to follow the existing curriculum. Do not be surprised to find out schools still teach kids things that were taught over 10 years ago. If your kids are lucky, they might be taught metalwork or woodwork somewhere from junior through to high school. Even though they learn, these skills it might be very unlikely that they would touch a 3D printer. In case the institution has a school 3D printer, it might not be a recent model. 3D printers have greatly evolved over the past 10 years. Today, the printers are easily accessible and affordable to hobbyists. You will definitely find the XYZprinting DaVinci miniMaker. The printer’s kindergarten colorful look is appealing to kids. Instead of seeing a boring educational machine, your kids might think it’s a toy. A similar model, the Da Vinci Mini, is more orange colored and would cost you around $30 more. However, it comes with Wi-Fi. The build quality of the DaVinci miniMaker is excellent. The 3D printer feels sturdy and is a very compact size (15.75 x 13.23 x 14.25-in). Age Group: 14+ (8+ with adult supervision). An adult will need to unpack it, set it up, remove completed parts and clean the printer after each use. The miniMaker doesn’t use the industrial standard G-code. Instead, it uses the XYZware software that’s included in the package. This has proven to be a limiting factor for hungry young minds. However, the printer is guaranteed to be working straight out the box. The XYZware software is a straightforward program. However, it does not produce feedback. For instance, when you click, it doesn’t give an indication if you did it the right way. You can make the printer face the other way when printing. However, this will be less fun. When the 3D printer is facing the front, you can take pictures and even videos while it’s printing. The XYZ kids’ 3D printer displays useful information. For example, there is information on how much filament the 3D object is going to use, and the amount of time it will build. Children usually get impatient when they have to wait for long times. Therefore, it is great that the printer provides an estimate production time. The software does a great job of automatically preparing your models for production. Unfortunately, you cannot add your own support leaving. Therefore, your children will not get to learn this area of 3D printing. The DaVinci miniMaker is easy to set up. You only have to plug in the USB and power cables, put the printhead in place, fill the filament tube of the printer head, and you are done. No calibration is required for the machine. The printer also comes with setup instructions, which are however a bit vague at times. However, you will not have any trouble setting up the printer even if you are a first-time 3D printer owner. It is important to find out how printing is done before you attempt to do printouts alone. The XYZ program has some models, which you can use for trial prints. If you want more models, I suggest you check them out at Thingiverse. For example, you can download Pokémon characters and print the models. The level of detail produced by the DaVinci miniMaker is commendable, given that e this machine is cheap. The miniMaker is also quiet when operating. This is impressive given that the machine is open-sided. You wouldn’t want to listen to the printing noise for a couple of hours. The biggest downside of the miniMaker 3D printer is that you can only use XYZ-exclusive filament with it. The problem is that the filament costs more than conventional brands available in the market. I think that the printer’s manufacturer doesn’t want entry-level users to insert the wrong filament in the printer. This is why the printers use only one type of filament. The machine has a chip inside the filament cylinder that checks the markers on the filament. From the check, it can know how much filament has been used. Therefore, if you insert a different filament brand, the printer will indicate there isn’t filament inside, and hence it simply won’t work. The only way you can get the printer to use a different filament is by probably changing the circuit board. Therefore, keep this in mind when looking to buy this 3D printer. However, the inability to use other brand filaments should not discourage you from buying the printer. This is because one filament reel can last for a long time. Moreover, the quality of the printouts from the printer is exceptional. This XYZ miniMaker is an awesome 3D Printer aimed at younger children and a non-tech savvy parent. The prints are detailed and of great quality. However, the simplicity of the printer may be a downside because your children could outgrow it fairly quickly, especially when they reach their adolescent years. Moreover, printing more complex models isn’t possible with this machine. Build Volume of 5.9" x 5.9" x 5.9"
The Monoprice Select Mini V2 is a very sturdy machine. The steel construction of this printer is quite elementary but in satisfying industrial way with no effort made to hide the bolt heads. The important parts of the 3D printer are covered well to avoid them getting damaged or causing injury. This printer looks like those that should be operated by a lab technician in a white coat. Science-enthusiastic teenagers will love this 3D printer which has a full-color display. While the display is not touchscreen, it has a fine clicky wheel right next to it positioned on a fancy brushed steel dish. The printer doesn’t come with any filament. However, at some stores, you can buy the printer with some sample filament. However, the filament would not be enough to print a full model. You need about $25 for a 1kg reel of PLA filament. You can shop around as the printer can use any brand filament. If you are not sure which PLA filament to go for, I recommend the Hatch box filament. Monoprice recommends using Simplify3D software, Replicator-G, Repetier, or Cura, which are all compatible with the 3D printer. Cura is the recommended software for the printer. The software allows you to manually control everything or you can set it to automatically complete everything. One benefit of using third party software is that they have advanced settings and better CAD model preparation. This software are the ones that are used in the 3D printing industry. The Monoprice Select Mini V2 does not come with setup instructions. However, you can download the instructions on Monoprice’s website. The printer comes with some default settings. However, I recommend you tweak the build surface to change it to its correct level. Feeding filament to the printer is somehow awkward since the machine won’t indicate whether you have done it correctly or not. To make feeding easier, you can cut off the last end of the strand at an angle. The Monoprice 3D printer is fairly loud compared to the other 3D printers in this review. Moreover, it does not have an SD card option. My trial part model printed fast, and problem free. The quality of the model was outstanding. However, a few tweaks to the build file and the quality can be further enhanced. The build speed is also a little slow, nonetheless since the Z-resolutions is quite high. This is the price to pay for the high-quality prints. However, since the software has many settings, you can tweak it as you want to achieve the perfect speed and printing quality. Generally, the quality of 3D models printed by any printer depends on the software settings. Preparing the CAD (STL files) is critical to the final output you will get. The multiple settings of the Select Mini give you the freedom to tweak them, and hence learn how to prepare for 3D printing and achieve the best prints. It will take you some time to get used to the printer’s roll wheel. The wheel sometimes moves to a menu you don’t want it to or goes the opposite direction of where you want it to go. However, this should not be a major cause for concern. While Monoprice indicates you can build your model with ABS filament, you are bound to encounter some failures with the filament. That is because ABS needs a bed temperature of 220°F while the printer only has a maximum bed temperature of about 140°F. Consider buying a different printer if you want to use ABS filament to build your models. Although you can’t print models on the Monoprice Select Mini V2 using ABS, the quality of your PLA models will not be compromised. Don’t look any further if you are looking for the best 3D printer for teens. The Monoprice Select Mini V2 is the perfect 3D printer to buy and is affordable. The printer’s downsides can be overlooked if you are just looking to buy your kids their very first 3D printer. If your children are interested in engineering, this printer would be great for them to get some practical experience. Supported operating systems windows 7 and later, Mac OS X, Linux.Monoprice Quality Assurance/Technical Assistance: Live chat Mon through Fri 6am - 6pm PST | Phone at 877-271-2592 Mon through Fri 6am - 5pm PST. Unlike other 3D printers in this review, the FlashForge Finder 3D printer looks more suitable for home printing or everyday home users. This machine will fit in perfectly with all your other tech gadgets. On the front, the machine has a beautiful clear full-color touch display. Overall, the 3D printer looks unintimidating, which is great for the less tech-savvy people. FlashForge Finder uses FlashPrint software to slice models. The software enables fully automated slicing and the support generator works well. From the manual options, you can change the temperature and printing speed for kids that want to move to the next level of part design. Standard features like the amount of material used is also included in the software. When you use the manual setting, you will notice the FlashPrint software is more advanced than the XYZware that comes with the DaVinci miniMaker. The software also has a few advanced options, such as “2D to 3D” that allows you to make an approximate 3D model from a 2D image. For example, you can use the settings to turn a face into a 3D model and print it. The FlashForge Finder comes with a USB stick that has a user guide in it. When you first turn on the printer, the touch display will guide you through the primary setup of flattening the printing bed. You will see instructions on how to fasten the adjusting nuts and adjust them to the right height. The guide is user-friendly and makes the setup, which would otherwise have been frustrating for a first timer, easy that could’ve. Feeding the filament into the printer is a little tricky. You will need to apply quite a bit of force to tug the thread through the extruder. You will most definitely not get it right the first time, but keep on trying. With this printer, you will get your 3D models hassle-free. Your model will take just within an hour to print if you use the printer’s default settings. The printer heats up fast and is relatively quiet when printing. The ability to remove the plate is one of the features that make the 3D printer stand out. It’s a shame that this feature is not included on all 3D machines for consumers. Being able to remove your from the building plate of the printer while it’s on your counter is easier than when it’s inside the printer every time you print a part. The disappointment rate of this printer is also low; very close to zero according to consumer reviews, even after a few weeks of use. While the FlashForge Finder 3D printer can be used with various PLA threads, the onboard strand container is a slightly smaller than that of a standard 3D printer. Therefore, if using other PLA brands, keep in mind to have the spool holder far from the machine, for example, on a bookshelf or right above it. There are various holders available on Thingiverse that you can use. This FlashForge Finder is a couple years ahead of its time. In a few years, it will be possible to buy the printer from any shop, just like you do now with the 2D printers on the market. The printer is pretty simple and considering its manufacturer’s guarantee, it’s the perfect option if you need to introduce your family to the 3D printing world. The Sindoh 3DWOX DP200 printer looks more like a home-based appliance rather than a printer you’ll find inside a lab. The printer looks like an innovative microwave with the see-through front opening. The filament and printing mechanism are inside the printer. The plastic pieces inside the printer have a solid feel and you will know the product is well-tested. Since the filament is inside the machine, it’s a little bigger than that of other 3D printers on the market. However, the printer’s cube shape makes it easier to put it on a counter beside you, unlike other open-designed printers that need space for you to access removable covers and filaments. The DP200 is a large printer. At 8.3″ x 7.9″ x 7.3″, the printer is one of the largest home-based 3D printers on the market. If you are looking for a big printer, the Sindoh 3DWOX DP200 is your best bet. The Sindoh 3DWOX DP200 comes with Sindoh’s own 3DWOX Desktop slicing software for printing models. The software has two modes: advanced and easy, and provides adequate control over file preparation as you might need. The Easy mode has an intuitive interface and, in most cases, leads to reliable, quality prints. However, you’ll have to wait a bit longer for the printing to be done. 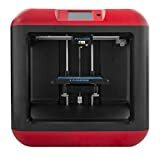 As you get more comfortable with the printer, you can move to Advanced mode and start playing with the settings for better 3D print file preparation and quality of your 3D models. The Sindoh 3DWOX DP200 comes already assembled. You only have to plug it in, add some filament, and calibrate the bed to start printing. When you turn on the printer for the first time, the color display will guide you through the calibration process. One of the advantages of the DP200 printer is that you can insert the filament cartridge into it, just like you would with a conventional table printer. The filament container system that the printer uses simplifies the procedures that other 3Dimentional printers struggle with. This means you are not likely to face any difficulties when filling the filament. After you’ve sent your 3D print file to the Sindoh 3DWOX printer, press the “Start” button for the machine to begin creating your model. If you have other things to do, you can move away from the printer and still monitor the printing progress through the printer’s built-in webcam. After your model has finished printing, removing it from the printer is easy, thanks to the flexible print bed. The DP200 machine only works with Sindoh’s filaments. Therefore, your models will be limited to the materials and colors that the filaments are made of. The good news is that Sindoh filaments are of high quality and produce reliable models. Moreover, they are affordable. The DP200 will print using ABS. Therefore, you have to think about ventilation as the vapors are somehow toxic. Ensure the building where will be printing your 3D models is well ventilated. If you don’t mind spending cash on a 3D printer, then this printer would be good for you. 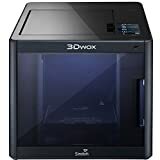 You will not be wrong if you buy the Sindoh 3DWOX DP200 printer. This machine produces professional standard models, and its design is hassle-free, just like the setup and the printing process. If your teenagers have experience with a 3D printer or are keen to learn about them, buy them this printer. With the printer, they can build their own models and will most probably venture into a field like engineering. This 3D printer will inspire them to achieve more. Offers automatic loading and unloading of filament; Insert a cartridge and 3DWOX will do the rest. Offers users the assisted leveling system; 3Dwox calculates and assists user in bed leveling. Includes a wide range of connectivity options (USB Flash Drive, Ethernet, Wi-Fi, USB Cable). Internal monitoring camera for remote viewing via PC, Laptop and Smart Phones. Below are each of the printers and where you can buy them. Final Verdict: Best hassle-free printer that produces high-quality prints.